Have you ever tested your application with targetSDKVersion < 23 in MarshMallow? 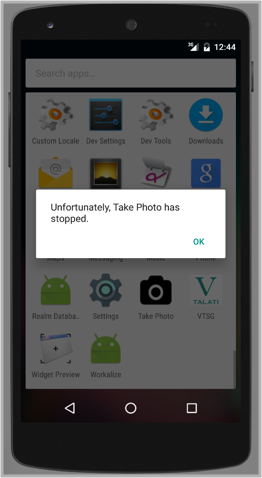 Have you ever faced an issue that your application is running well on other devices, but causing crash on MarshMallow? Are you familiar with "Requesting Permission at Runtime" concept? Few days ago, I also faced the same issue on one of my applications. So, I thought to write a blog post on this issue. "Are you targeting devices having MarshMallow OS? Then you have to implement Requesting Permissions at Run Time concept in your code." But why it’s necessary to implement? 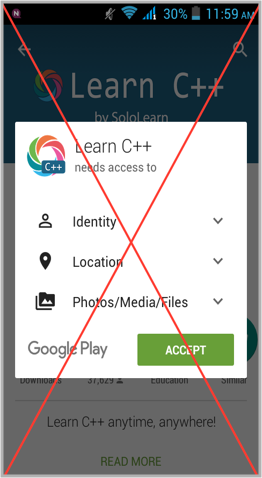 Because MarshMallow doesn’t ask for permission, when we install our application. Ohh, then what it does for Permission Requests? i.e. Requesting Permissions at Run Time. It means you have to grant permission for external storage reading/writing, Sending/ Receiving SMS, accessing camera etc at runtime. This concept is beneficial because users can stay informed about each & every permission which he/ she grants to the application. 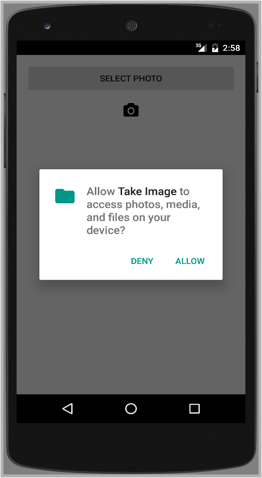 User can revoke the granted permission through Settings >> Apps >> Take Photo App >> Permissions from his/her device. If I don’t want to implement this new concept, then what? If you don’t implement runtime permission, then your application will crash or will not work properly on the device having MarshMallow. Here, one interesting thing is that dangerous permissions are grouped into the Permission Group, as displayed in the table. But what does it mean? It means that you need to request for only one permission from group. If any permission from permission group is granted, then other permissions from the same group will be granted automatically. Likewise if any permission from permission group is denied, then entire group will be denied. Once READ_EXTERNAL_STORAGE is granted, application will also grant WRITE_EXTERNAL_STORAGE permission. Hey wait, what about already launched Applications? Yeah, Red Sign for Older Applications!!! Now, If you understand above description properly then you might have question that what about already launched application? What do you think, will it crash? Application with targetSDKVersion less than 23 will be installed on MarshMallow device as usual & will ask for the required permissions at install time. But here one risk exists, If user tries to manually revoke the permission, then system will warn that this permission is necessary to run that application properly. Still if user revokes permission, then application will run properly on targetSDKVersion less than 23. But it will crash on SDK 23 or more. 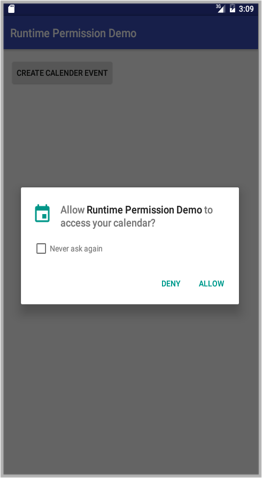 I hope you are now pretty much aware with Runtime Permission concept in MarshMallow. Let’s understand this using an example. 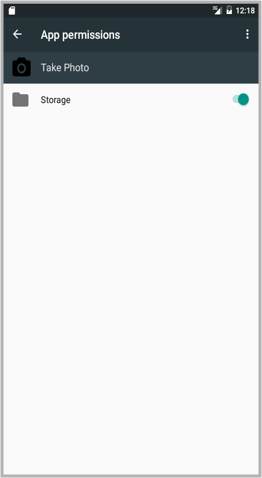 Create a simple project in Android Studio with blank activity. If you don’t know how to create new project in Android Studio. Here, I am checking for runtime permission on onClick() of Button by calling checkPermission() method. If permission has already been granted, then writeCalendarEvent() method will be called to write event. checkPermission() will check runtime permission only if current API version has been MarshMallow or more. It will display permission request dialog, If permission has not been granted. 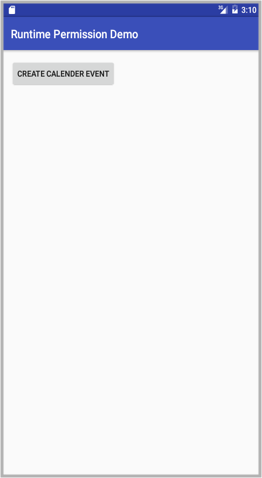 Here, I have used ActivityCompat.shouldShowRequestPermissionRationale(), What’s that?? If once user denied permission request, then it has been assumed that user cannot get the proper idea about why permission is required? Therefore after that, permission description dialog will be displayed each time before permission request dialog. writeCalendarEvent() will write calendar event without using Intent. If you write calendar event via intent then WRITE_CALENDAR or READ_CALENDAR permissions are not required. onRequestPermissionsResult() is inbuilt method, which receives Permission Request Dialog’s callback. Here, if permission has been granted, then I am calling writeCalendarEvent() to write calendar event. 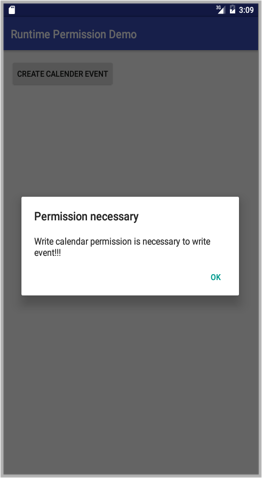 For creating calendar event we need to add WRITE_CALENDAR permission. I hope you find this blog post very helpful while with Requesting Permissions at Runtime concept. Let me know in comment if you have any questions regarding Runtime Permission Request. I will reply you ASAP. 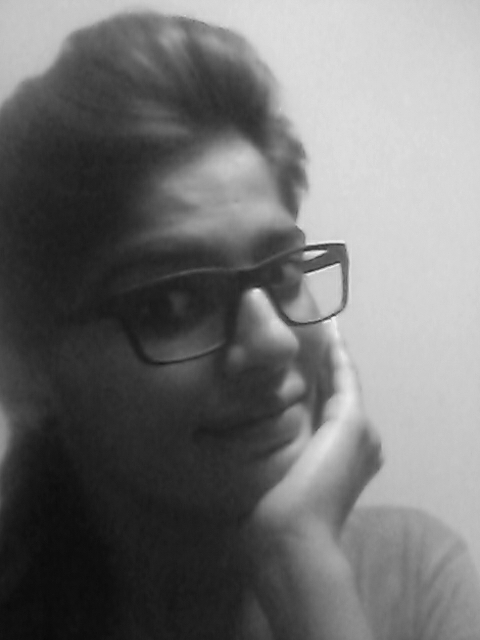 I am a passionate Android Developer.I like to develop different android applications with new concepts and ideas.